UPDATE: Comment from Brian, that Lee Valley sells these. This looks like a nifty gadget. 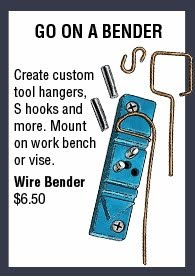 A little thingy that you can mount on a bench for bending light wire into various shapes. The little pins can be used for a more "custom" bend. 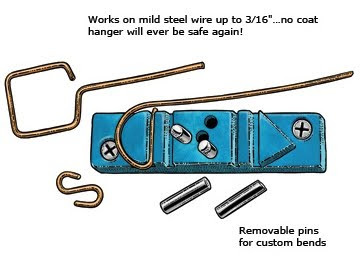 It's from the Duluth Trading Company. Anybody ever see one around these parts ? Lee Valley, the rich guys Princess Auto!